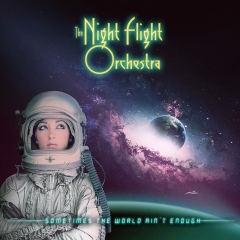 The brainchild of Soilwork-vocalist Björn ‘Speed’ Strid and -guitarist David Andersson, the Night Flight Orchestra came together while the two musicians were touring the USA in 2007, and was originally envisioned as nothing more than a light-hearted side-project for channeling their shared love of album-oriented rock from the ‘70s and ‘80s. But after bolstering their line-up with bassist Sharlee D’Angelo (of Arch Enemy & Spiritual Beggars), drummer Jonas Källsbäck (of Mean Streak) and keyboardist Richard Larsson (of Von Benzo), it became obvious that the ‘Orchestra would blossom into a serious band in its own right, releasing two full-length albums (2012’s “Internal Affairs” and 2015’s “Skyline Whispers”) and eventually signing a glitzy deal with Nuclear Blast in 2016 to take the project to the next level. That relationship has produced another two records in as many years, the former of which (2017’s “Amber Galactic”) was nominated for the esteemed Swedish Grammy Award, and the latter of which came out earlier this summer and has been lauded by rave reviews thus far. 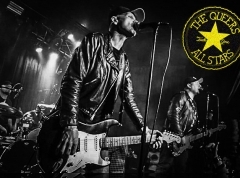 Quite fittingly, considering the band’s meteoric rise, the effort carries the title “Sometimes the World Ain’t Enough”, and continues unabashed the Swedish constellation’s quest to revive classic mainstream rock. Even those who normally are averse to Europe, Foreigner, Houston and other bands of that ilk might be convinced otherwise by the collection of songs the ‘Orchestra has assembled here. There is absolutely nothing innovative about it; Strid & co. remain true to the genre, laying down glistening sheets of synth to mingle with riffs that stumble over one another to be the poppiest and/or most melodic, and distilling them into a traditional ABABCB format in which the chorus determines the success of a song. But that is one area in which TNFO excels: busting out choruses that will shanghai your lips after just one listen, and add another voice to propagating Andersson’s fantastical hyperboles about lowly men who set about conquering space under the leadership of superior women, and then fall hopelessly in love with them. The other voice, of course, is that of Strid, who — despite being no stranger to singing as per his role in Soilwork — demonstrates an entire new dimension of ability in these songs, especially when reaching for those powerful falsetto notes in the likes of the title track. He is bolstered by the two backing singers, Anna-Mia Bonde & Anna Brygård, whose subtle contributions really make Strid’s voice stand out, as well as adding even more depth and variety to the lushly melodic soundscape. “Sometimes…” is a thoroughly entertaining listen then, and even a breath of fresh air in the sense that most people would think the AOR genre has long since been consigned to the annals of history. Anyone with a fondness for the melodrama and shamelessness of decades now past is likely to find their sense of nostalgia awakened by the A-ha- and ABBA-esque balladry heard in “Lovers in the Rain” and “Barcelona”, not to mention the progressive bombast of the final piece, “The Last of the Independent Romantics”, which clocks in at an entirely unnecessary, but oh-so-rewarding 9 minutes and 16 seconds of histrionic guitar and synth wankery. The only point of criticism is that the album slightly outstays its welcome and in doing so, includes a degree of material of the filler sort. Indeed, there are a number of moments splattered across the record that do little to move the plot along (except lyrically, perhaps), and had these been shaved off in favour of a more focused and compact undertaking, the impact of “Sometimes the World Ain’t Enough” might have been even stronger. But even so, those looking to switch off and lose themselves in a veritable feast of truly retro rock music have been handed an absolute must-own in the Night Flight Orchestra’s latest creation — one that is certain to boost the supergroup’s surging popularity.